Give us a call and one of our professionals will assist with any of your questions. We can guide you throught the repair process. We can also provide you with the right tools like shutter hinges, pins, louvers, and any other part you may need. Maybe you have shutters that require a hinge that is discontinued and can't be replaced. We will provide the replacement part or the next best thing to finish your project. We can provide you with a box or screws, box of pins, small or large quantity of louvers, or what ever you need. In these times of economic stress, you can save Money. Let us show you how. We provide Full service or you can do it yourself. Call us and tell us what you need. Can't find it in home depot? Is the company that makes the parts for your shutters closed? Did your dog or cat bite and damage you shutters? Call today and we will match all your parts or offer suggestions. We can ship one piece or a dozen if needed. We can also match any color of stain or Paint, just provide us with the brand of paint and the color swatch or number, we will do the rest. We will provide good customer service. No matter what company you baught from. 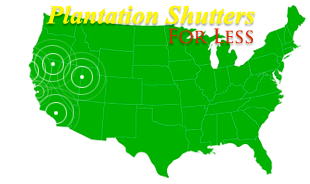 You can also contact us and send a photo via email info@plantationshuttersforless.com and we can do our best to explain what the best solution would be depending on the repair. Some of the tools needed are the following. Plantation Shutters are interior wood shutters popularized in the South which have become very popular in the design world. Both used as decorations and to block out sunlight, plantation shutters have uniform pieces and parts that distinguish them from other types of wood shutters. They feature wood slats, called louvers, connected to a tilt rod that runs down the center. Moving the tilt rod up and down opens and closes the louvers, thus opening and closing the shutter. The stiles are the two sides of the shutter and the rails are the top and bottom of the shutter. 1. Decide which size staple you need. The appropriate staple should stick out the same distance as the other staples when placed in the existing hole(s). 2. Put tilt rods and louvers in the full open position. Roll the tilt rod to either side in order to determine which side gives the best access to the staple holes. 3. Hold the staple by its crown with the needle-nosed pliers. Add glue to each end of the staple. 4. Thread staple past the tilt rod into the louver holes. Push the staple straight in the hole, but not too far or too hard. 5. Cut the staple on the damaged louver with the wire-cutters in the middle of the crown. Remove shutter panel from the wall or window. 6. Slice the pin between the damaged louver and the stile with the utility knife. Once free, remove the louver from the panel. 7. Remove both halves of louver staple with the vise-grip one at a time. 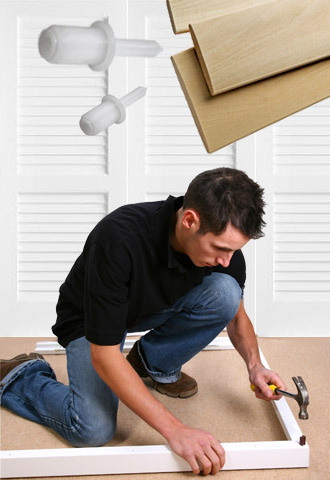 Make sure to pull the staple straight out or risk further damage to the shutters. 8. Put the louvers in full open position using the tilt rod. Put the skinny end of a nylon pin into the hole at either end of the louver. Put the thick end of a repair pin into the shutter pinhole on the stile. If it will not go the entire way in, drill the hole deeper with a 1/4-inch bit. 9. Insert the thick end of the nylon pin into the hole opposite the repair pin. Push in the repair pin and situate the louver until the pin pops in the louver-hole. 10. Unscrew the screws attached to the shutter hinges. These screws may be either flat-head or Phillips, so be sure to have the correct screwdriver. 11. Remove shutter panel from hinge hardware. Remove hinge hardware. 12. Utilizing the same hardware holes, screw in the new hinges. 13. Screw the shutter panel back to the new hinges.